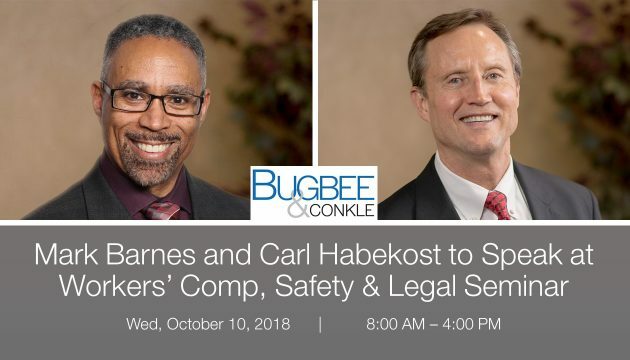 On Wed, October 10, 2018, from 8:00 AM – 4:00 PM at the Radisson Hotel at The University of Toledo, Bugbee & Conkle, V+A Risk Services, and Cardinal Compliance Consultants will co-host a Workers’ Comp, Safety & Legal Seminar. Seven guest speakers, including attorneys Mark Barnes and Carl Habekost, will discuss a variety of topics including workers’ compensation claim strategies, workplace violence, tragic events, the legality of marijuana, the opioid crisis, and more. Breakfast and lunch will be provided as well as an opportunity to win prizes! Select More Info button below for full agenda and registration information.